Chilling, malevolent voices whisper from the walls only to Harry, and it seems certain that his classmate Draco Malfoy is out to get him. Soon it's not just Harry who is worried about survival, as dreadful things begin to happen at Hogwarts. 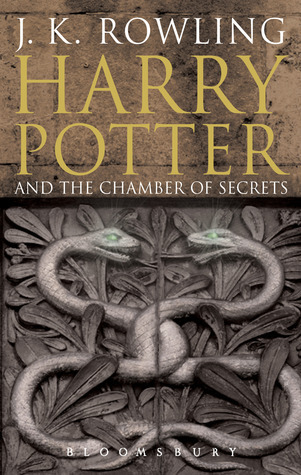 The mysteriously gleaming, foot-high words on the wall proclaim, "The Chamber of Secrets Has Been Opened. Enemies of the Heir, Beware." But what exactly does it mean? Harry, Hermione, and Ron do everything that is wizardly possible--including risking their own lives--to solve this 50-year-old, seemingly deadly mystery. Harry’s had another terrible summer. None of his friends wrote to him, all his stuff was locked away and Hedwig was miserable, locked in her cage. Harry was in constant fight with his family and it didn’t help when he got a visitor on a very important night for his uncle. Dobby the house elf came to warn him to not return to Hogwarts, and after Harry refused, Dobby tricked him. Harry got bars on his window and a cat door for food installed and it was only because of Ron that he escaped his prison. Ron came to rescue Harry with his twin brothers in a flying car. After a successful escape, Harry had a great remainder of summer at the Burrow. More trouble arose after Ron an Harry were unable to go to the Platform 9 3/4 after the passage sealed. They flew Ron’s father’s car to Hogwarts and got detention for it. But that was only the start. Strange happenings were going on at the school – people kept getting petrified because the heir of Slytherin was letting a monster loose on all the ‘Mudbloods’. They all started to suspect Harry after they learnt he can talk to snakes. Harry meanwhile had other troubles as well: he got attacked by a rogue bludger – it turned out to be Dobby’s, to get Harry to get home again, just like sealing the passage at the train station was Dobby’s work as well. After the number of petrified people was too great, they arrested Hagrid on account of old suspicions, and forced Dumbledore to leave his post as the headmaster. Harry and Ron decided to take matters in their own hands and, with a little help from Hermione, stopped Lord Voldemort from rising again. It turned out he was controlling Ron’s sister Ginny to gain power, but Harry killed the beast, and the diary Voldemort was using, to beat him once more. Harry’s had another terrible summer. None of his friends wrote to him all summer, all his stuff was locked away in the cupboard under the stairs and Hedwig was miserable, locked in her cage, unable to exercise a little. Harry was in constant fight with his family and it didn’t help when he got a visitor on a very important night for his uncle. Dobby the house elf came to warn him to not return to Hogwarts, because bad things will happen in the next school year. He told Harry he was holding back all his letters because he thought that might persuade Harry to stay home. But Harry disregarded the warning so Dobby got Harry in trouble when he made the after-dinner pudding crash in the kitchen. After that Dobby disappeared and Harry got a letter from the ministry with a warning, since he’s not allowed to do magic outside of school. Dinner with the investor was therefore ruined; the Dursleys were super mad and locked Harry in his room. Uncle Vernon had bars installed on Harry’s window and a cat flap in his door for 3 lame meals per day. Harry was rescued long and lonely days later by his friend Ron and Ron’s twin brothers Fred and George in their flying car, spending the summer at the Weasley home the Burrow and having the best time. When traveling to Diagon Alley to get books, Harry accidentally ended up in Knockturn Alley, a place for dark arts lovers, in a weird shop. Hiding in a wardrobe, he saw Draco and his father come in and make some selling arrangements. Fortunately, Hagrid (who was buying flesh-eating slug repellent) guided Harry safely to Diagon Alley to shop for school supplies. In the company of the Weasleys, Harry met the famous Gilderoy Lockhart while buying new schools books. Lockhart announced he will be the new Defense Against the Dark Arts teacher at Hogwarts, got a photo with Harry for The Daily Prophet and gifted Harry his entire works. While leaving, they met Draco and his father again. Mr. Weasley and Mr. Malfoy got in a row and had to be forcefully separated. Soon after, the Weasleys departed with Harry to go to the train station on September 1st. They were rather late coming there and they all hurried to the passage to the Hogwarts platform. Harry and Ron went last and when they try to go through together, they crashed. The passage was sealed so they couldn’t cross. They missed the train for school, so Ron had an idea to fly the Weasley’s car to Hogwarts instead. They made it almost to school before the car started acting weird. Ron lost his control over the car and it fell down from the sky and crashed into a Whoomping Willow – an old tree which attacks any person that comes near. Ron and Harry escaped from it but lost the car in the process. It ran straight for the forest. Harry and Ron were found by Snape, led to his office, yelled at and interrogated by Snape, McGonagall and Dumbledore. They both got detention and the next day, Molly Weasley sent a Howler to Ron, threatening to bring him home if he puts a toe out of line. Ron also broke his wand in the crash and was now having troubles with it. Their first DADA lesson was a disaster. Lockhart was an incompetent teacher, more concerned with personal accomplishment than teaching. He quizzed the class on his favorite color etc. and only Hermione managed to answer correctly on all questions. He also let loose a cage of Pixies and left Harry, Ron and Hermione to deal with them after they went berzerk. On Halloween, Filch’s cat, Mrs. Norris, was petrified. “The Chamber of Secrets has been opened, enemies of the heir beware.” writing was found scrawled on a wall in the castle in big red letters. Harry, Ron and Hermione discoveredd that one of Hogwarts’ founders, Salazar Slytherin, secretly built the Chamber of Secrets, which is rumoured to contain a monster only Slytherin’s heir can have under direct control. The monster was there to purge the school of all Mudbloods. Harry was training harder and more often with the team to win the Quidditch cup this year, and one day just before they started training, Slytherins came to take over the pitch. They had to ‘break in’ the new seeker that turned out to be Draco Malfoy. The other new thing were new brooms for the whole team – Numbus 2001 – that Draco’s father bought for the Slytherins. That caused Hermione to point out at least nobody in Gryffindor team had to buy their way in, to which Draco replied with an insult ‘Mudblood’. That resulted in a huge uproar and Ron blasting a curse at Draco, that backfired. Ron was throwing up slugs for a few hours that day. First Quidditch game of the season, Harry was pursued by a rogue Bludger, which caused Harry’s arm to be broken, but Harry still managed to catch the snitch and win the game. Lockhart volunteered to heal the broken bones in Harry’s arm but removed them completely instead. That night, as Harry was in the hospital regrowing his bones, Dobby appeared and admitted he was the one that sealed the passage to the platform and set the Bludger after Harry. He begged Harry to leave Hogwarts again, sensing that he is in a grave danger and likely will die if he doesn’t comply with him. The talk with Dobby was interrupted by a new arrival at the hospital wing. Colin Creevey, was attacked and petrified and brought in by Dumbledore and McGonagall. They hoped he might have caught the attacker on his camera but the film was fried. Dumbledore admitted that the Chamber has been opened again for sure. During the first meeting of Lockhart’s new dueling club, Harry dueled with Draco, who cast a spell that produced a snake. After Lockhart unsuccessfully tried to get rid of it, the snake tried to attack a student. Harry unwittingly spoke Parseltongue and stopped the snake from attacking a boy. Harry’s ability frightened everyone because Salazar Slytherin was also able to speak Parseltongue, and his heir would also have this ability, causing everybody in the school to think that Harry is actually Slytherin’s heir. Suspecting that Draco is actually the heir of Slytherin, the trio decided to make Polyjuice Potion, a brew which allows the drinker to look like someone else for a limited amount of time. The ingredients were hard to come by and they had to steal from Snape in order to finish it, but making of the potion still took a whole month and it was ready on Christmas. Harry came under further suspicion when he stumbled upon the petrified bodies of Justin Finch-Fletchley (the student who was almost attacked by the snake), and the Gryffindor’s ghost Nearly Headless Nick. He was brought before Dumbledore, who assured him Harry is not a suspect in his eyes. At Christmas, Harry and Ron used the finished Polyjuice Potion to disguise themselves as Crabbe and Goyle, while Hermione was supposed to turn in Milicent Bulstrode. Hermione’s transformation went south so Harry and Ron had to infiltrate Slytherin’s common room by themselves. They discovered that Draco was not the heir of Slytherin, and that the Chamber was opened 50 years before when a Muggle-born girl died. After a few quiet months, Harry found a diary in a flooded bathroom. It turned out somebody threw it through Moaning Myrtle’s head while presumably trying to get rid of it. The diary seemed empty and didn’t yield any information, until Harry’s ink spilled all over it and the diary stayed dry and spotless. Harry wrote in the diary, which responded in writing, telling Harry it’s Tom Riddle’s, a boy who was at Hogwarts 50 years before. Harry was shown the events after the death of the Muggle-born girl half a decade ago when Tom accused Hagrid, then in third year of schooling, of opening the Chamber of Secrets and being responsible for the girl’s death. That resulted in Hagrid’s expulsion. Some time later, Harry’s room was ransacked and the diary was taken. Harry tried to figure out which Gryffindor student took it. On the day of the next game Hermione got an idea and left for the library before the game. The game never started, however; Hermione and a Ravenclaw girl were found petrified as well. Harry and Ron intended to question Hagrid, but before they could, he was accused of opening the Chamber of Secrets again, and was sentenced to Azkaban prison. On the same evening, while Harry and Ron were hiding in the hut under the cloak, Dumbledore was asked to stand down as the headmaster by Lucius Malfoy. Before Hagrid was led away, he secretly instructed Harry and Ron to “follow the spiders” to learn the truth, while Dumbledore hinted that “Help will always be given at Hogwarts to those who ask for it.”. Not long after that Harry and Ron followed the spiders to the Forbidden Forest. There they encountered Aragog, a giant spider, who told them the monster that killed the girl 50 years before was not him (as suspected), that the girl’s body was found in a bathroom, and that Hagrid is innocent. After that Aragog left them to be eaten by his enormous family, but they managed to escape with the help of Mr Weasley’s car that was living in the wild ever since the crash. Going back to the castle they realised that Moaning Myrtle, the ghost who haunted the bathroom where they made the Polyjuice Potion, must have been the girl Aragog was referring to. Harry and Ron were caught in the corridors after one class and lied to McGonagall they wanted to visit Hermione. After they got the approval, they went straight to hospital wing. There Harry found a piece of paper clutched in Hermione’s hand. It said that the monster in the Chamber is a Basilisk, a giant snake that kills those who look it in the eye. Harry and Ron figured out why nobody has died yet: none of the petrified people saw the snake directly. Hermione also wrote “pipes”, making the boys realize that’s how the snake has been traveling around. They left to inform professor McGonagall about what they learned, but nobody was in the staff room. Soon after there was an announcement that all students should return to their dormitories while all the staff should meet in the staff room. They hid in a coat closet and listened: Ron’s sister Ginny has been taken into the Chamber. When Lockhart barged in, utterly ignorant, all professors told him his time has finally come; he must go get Ginny. Realising he’s their only hope, Ron and Harry left for Lockhart’s office to tell him all they knew. Instead of preparing to save Ginny, Lockhart was packing to leave. It turned out he was not responsible for the stuff in his books; he stole the credit from other wizards and modified their memories. He tried to attack Harry and Ron as well, but they were too fast. They marched him to Myrtle’s toilet to ask about her death. With her help they discovered the entrance to the Chamber of Secrets. Sliding down the tunnel they ended up far below the castle. Lockhart, momentarily forgotten by the boys, stole Ron’s wand and attempted a memory charm on the boys, trying to take all the credit again, this time for the Chamber. As he prepared to erase their memories, Ron’s broken wand backfired the spell back at Lockhart, knocking him down and erasing all of his memories. The bang also caved the tunnel in and separated Harry from Ron. Harry was forced to go on alone while Ron was left to shift some rocks. Harry soon found a door with two snakes and opened it using Parseltongue. Inside the chamber, Harry found Ginny unconscious and barely alive, as well as the almost-physical form of Tom Riddle. He learned it was Riddle who Ginny has been communicating with through the diary – by revealing all her deepest secrets, she poured her soul into it. Soon Riddle was able to pour some of his own back into her to possess her. She was the one killing all Hagrid’s roosters, she wrote the messages on the walls and she let the Basilisk loose in school. Ginny realised that the diary wasn’t what it seemed to be and tried to dispose of it in Myrtle’s bathroom, but stole it back when she saw Harry with it, afraid that her crimes would be revealed. Riddle then forced Ginny to enter the Chamber in order to lure Harry down after her, and by possessing Ginny’s soul, Tom began to take physical form, feeding on her receding energy. Riddle also revealed that Tom Marvolo Riddle is an anagram for I am Lord Voldemort. Riddle then summoned the Basilisk and had it attack Harry. Just when it seemed Harry will die, Fawkes, Dumbledore’s phoenix, appeared and blinded the Basilisk. Fawkes also brought Harry the Sorting Hat, which Harry used to ask for help, hanging on Dumbledore’s words. The hat gave Harry a sword with which Harry killed the Basilisk, but one of its fangs pierces Harry’s arm nevertheless, dooming him to die. Harry almost gave up under the triumphant stare of Riddle, when Fawkes saved him – phoenix tears have healing powers. Fawkes then brought Harry the diary that lay discarded by Ginny, and Harry stabbed it with a Basilisk fang, defeating Riddle and saving Ginny. The two returned to Ron and Lockhart with Fawkes, who carried them all back up to school. They burst into McGonagall’s office where Ginny was reunited with her parents and sent to the hospital, and Ron and Harry got congratulated by Dumbledore and won 400 points total for their house. Ron was sent to send an owl to bring Hagrid back while Harry was assured he was a true Gryffindor by Dumbledore. Their talk was interrupted by Lucius Malfoy who was mad Dumbledore was back. Headmaster told him all the other school governors were suddenly okay with Dumbledore returning. He also informed Malfoy about Harry saving the day. In the aftermath, Harry accused Lucius Malfoy of putting the diary in Ginny’s cauldron and was set on returning it. He tricked Malfoy to drop the sock the diary was wrapped in which saved Malfoy’s house-elf Dobby.